It has been hotter than Hades in Austin, TX so my usual red wine drinking has taken a backseat to lighter fare to help me beat the heat. 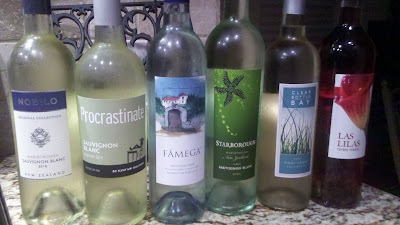 I am generally not fan of white wines. They are often too oaky or too sweet to my palette. I have managed to find a few choice bottles of white wines that are neither oaky or sweet and fall beneath $15 per bottle, making them excellent pairings for both your Summer meals and pocketbook. Famega Vinho Verde 2009. Vino Verde is a light, effervescent and refreshing wine produced in Portrugal that is great on it's own or with a grilled jerk chicken breast. Starborough Sauvignon Blanc 2009 from Marlborough, New Zealand has a fantastic tropical fruit and a lemon zest flavor that pairs nicely with some grilled Talipia. Clear Bottle Bay Pinot Grigio 2007 from California tastes more like an unoaked Chardonnay with flavors of green apple and a hit of pear than traditional Pinot Grigios. Priced at pocketbook friendly $3.99 this drinkable wine pairs nicely with spicy Indian food or Szechuan Chinese take out.